Enjoy a cup of our loose leaf Oolong teas. 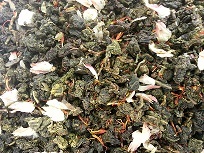 Traditional Tie Guan Yin oolong is enhanced with the fruity, ethereal fragrance of osmanthus flowers using ancient scenting techniques. Ingredients: Organic Oolong tea, Organic Osmanthus flowers. 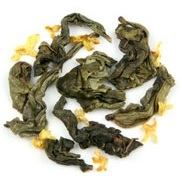 Orchid oolong notes in a synergistic relationship with floral jasmine. Light fruit notes on the finish. Ingredients: Oolong tea, Green tea, Mango & Apple & Strawberry & Peach pieces, Jasmine & Safflower petals. Inspired by the delicate floral and fruity notes in a glass of sweet champagne, this tea blends the voluptuous scent of blooming roses with the summery flavor of fresh-picked strawberries. 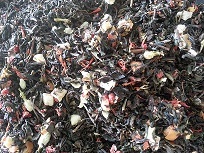 Ingredients: Oolong Tea, Dried Apples, Raisins, Licorice Root, Hibiscus, Fennel, Pineapple Cubes (pineapple sugar) Juniper Berries, Rose Buds, Strawberry, Anise, Rosehips, Peach Cubes (peach, rice flower) Star Anise, Vanilla Bean and Natural Flavors.